It may still be in beta but iOS 6 - anticipated to come this fall - has apparently added a new feature that's going to make many Apple handset users very happy. The feature, called "Wi-Fi Plus Cellular," automatically toggles iPhones back to 3G cellular data until the clutter clears out of an inadvertently joined Wi-Fi network. Apple has apparently finally recognized the headaches caused by current iOS's tendencies to hop on an open Wi-Fi connection no matter how strong the signal. iOS device users can commiserate over the experience: data speeds that were once flying slow to a crawl - if not grind to a halt - until a user either temporarily disables Wi-Fi or "forgets" the network at issue. Should the feature make its way onto iOS 6's final version, users will be able to get back onto cellular data to keep things like their iCloud docs, iTunes purchases, Passbook and Reading lists current. If that's not enough, "Wi-Fi Plus Cellular" will also try to keep FaceTime video conferences from dropping on iPhone 4S or greater. What's not yet clear is how individual carriers will handle cellular data use for FaceTime. In an earlier finding from iOS 6's beta, it looked as though AT&T may charge for the capability. 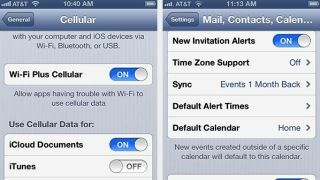 Currently, AT&T's capability is limited to Wi-Fi in iOS 5. Should the Wi-Fi feature make its way onto the new iOS, we should be looking at a whole new level of convenient and capable connectivity.